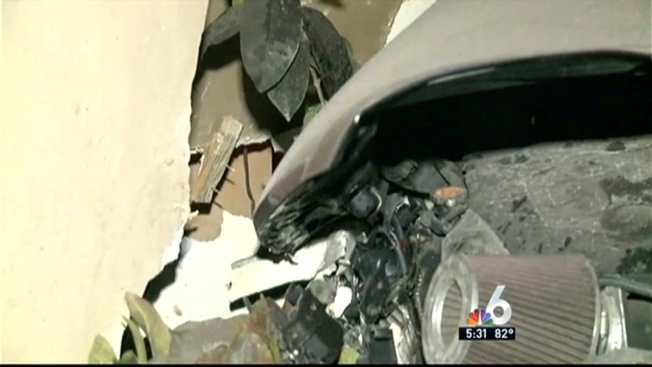 A North Miami home was left with a gaping hole in its side Thursday morning after a car slammed into it in the overnight hours. Police say the four car accident happened at around 1:40 a.m. outside the house located at Northeast 12th Avenue and 147th Street in North Miami. According to police, a black Nissan failed to yield and ran a stop sign at a four-way intersection, causing two other cars to swerve and lose control. One of those cars slammed into another, causing it to run into the house. 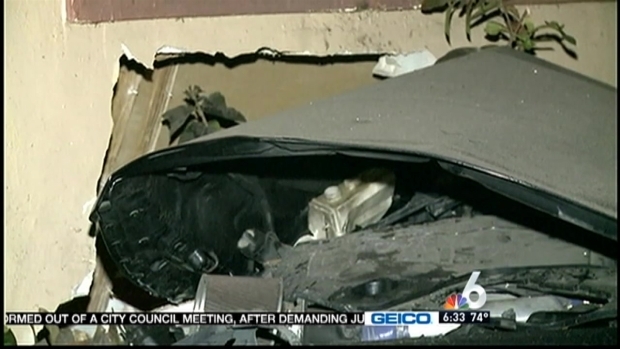 A car slammed into a house in the overnight hours in North Miami. Bobby Brooks is there. Two people were inside the home at the time. Neither were injured. "Even though the vehicle struck the house and made significant damage to the wall of the house, the people who were inside luckily were not injured," Miami-Dade Fire Rescue Chief Jose Herrera said. Witnesses in the neighborhood believe racing was involved, however police tell NBC 6 South Florida there's no proof of that. Police say the driver who was responsible for hitting the car that went into the house left the scene after the accident. The car is a four-door white sedan with front end damage, police said. Anyone with information is asked to call Miami-Dade Crime Stoppers at 305-471-TIPS.